OOH-LA-LA! SPRING IS IN THE AIR. BREE AND I FINISH DECORATING OUR EASTER EGGS. WHAT ELSE CAN WE DO THAT WOULD BE EXTRA SPRING-Y? WE DECIDE TO USE REAL FLOWERS IN OUR DESIGNS! With costume design done, Nancy throws her imagination into designing blossom-themed handmade invitations, which, of course, must be hand delivered while they are as fresh as a daisy. Dad and Bree's brother Freddy are recruited to play paparazzi and record the entrance of the celebrities. Elegant refreshments and a lovely tea table designed by Mom provides just the aura for a spring fashion show, and daisy chains, phlox, and tulips complete the decor for the salon. Nancy herself trips over some of the trailing table decor, and the tea table crashes to the floor. There are broken Easter eggs, smooshed delicacies, and crushed flowers all over. Is the spring bash a bust? 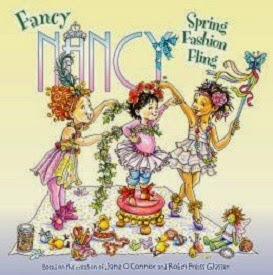 But with Nancy Clancy in charge, the show always goes on, in Jane O'Connor's latest Clancy clan venture, Fancy Nancy: Spring Fashion Fling (HarperFestival, 2015). With flowers, fashions, dolls, and Frenchy the poodle decked in pastels, it's an festive event to make everyone forget the sooty snows of winter. Inexpensive and definitely vocabulary building, this one even includes plenty of stickers to adorn those invitations that young readers will likely be creating for their own spring flings. Here's a succulent idea to discuss your subsequent benefit sell procurement getting together with.Spring Fashion New york Fashion 7 days lotto tickets will promote fast your fundraiser, and securing these may very well be seeing that effortless seeing that speaking with the best-dressed female on the sell panel.